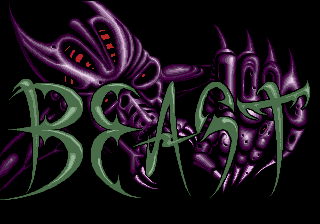 Shadow of the Beast, called Shadow of the Beast: Mashou no Okite (シャドー･オブ･ザ･ビースト 魔性の掟) in Japan, is an action game developed by Reflections Interactive for the Commodore Amiga and published by Psygnosis. It was brought to a variety of systems including the Sega Mega Drive and Sega Master System in 1991 and 1992 respectively. It was followed by Shadow of the Beast II and the Amiga-exclusive Shadow of the Beast III. You play as the Beast Messenger. Born a human child and kidnapped at a young age by mages who serve the Beast Lord, you were transformed into a monster and had all your memories wiped to enter a lifetime of servitude. However, suddenly, all your memories return to you and you seek revenge and escape. and jump. punches. in midair kicks. The players has 12 hit points. Losing all of them (gradually or through instant kill attacks/traps) restarts the game as there are no lives. A bazooka-like weapon can be found later on. A short flying section also exists. Hit detection is very strict. Often the player will run into situations were damage is basically unavoidable, or it's more convenient to take a hit on purpose and use the resulting invincibility to avoid further damage by running away. The game was a baby step into the realm of non-linear game design, as stages can be at least partially explored and re-explored without having all key items. A fixed set of objectives needs to be performed to play the full however. The Amiga version was considered impressive for it's time with atmospheric soundtrack and graphics, which had multiple scrolling planes, color usage and diverse graphics, however the Sega Mega Drive was scaled back, with some enemies missing or their position being altered. The Mega Drive game was not optimised for North American NTSC-U machines, and so runs too fast. This was corrected in the Japanese release, which also makes adjustments to the graphics, adds a proper ending sequence and includes a much need additional healing item in a later stage. The changes were reportedly made at the request of Japanese publisher Victor Musical Industries. Master Systen version is even more scaled back from the Mega Drive port. Most of the interior background art is removed and replaced with simplified dark or blue backgrounds. It has no cutscenes like the ones seen in 16bit ports and instead they are replaced with black and white text. Developers of the Master System version somehow felt the need to introduce an inventory system to the game. In every other version, power ups and other items are instantly used while in the Master System port, they are added to the inventory, which is accessible by pressing 2 button. While this can be considered a benefical update, as it allows players to stock up and use items later, inventory can only carry 7 items and game gives no clue about the item in your possession. Not even the manual explains what these items do and only way to find out their effects is to use them, which may result in players wasting a precious quest item and potentially ruin the game. (Used quest items do not return) In the original game, all common and important items are used immidiately after picking up. Using button 2 as an inventory screen also forces players to use up in the direction pad to jump, not the best button configuration for a side scrolling platforming game. Why developers decided to make this baffling change is unknown. Master System version is also announces the player every time a boss appears, making this the only port of the game in which names of the bosses can be seen. Main article: Shadow of the Beast/Magazine articles. Main article: Shadow of the Beast/Promotional material. NEC Retro has more information related to Shadow of the Beast.